Abu Dhabi, UAE, 8th January 2019: The CSI1* Al Shira’aa International Horse Show came to an end on Monday evening with victory for young Emirati rider Eisa Omran Al Owais who defeated far more experienced competitors to claim the 120cm class at Al Forsan Equestrian Centre. 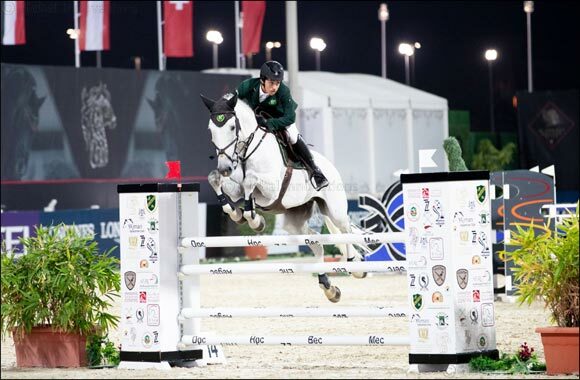 Al Owais, from Sharjah, was one of 15 riders to jump clear and qualify for the jump off against the clock. The 14-year-old displayed wisdom beyond his years, guiding his mount, Avelon to the slowest of the opening rounds and ensuring his spot in the jump off. He then kicked on in the second round, shaving hundredths of seconds off his time by taking fences at acute angles and speeding between the jumps. His time of 32.82sec proved too fast for the rest and he claimed the €4,250 first prize. Second place went to the UAE’s Omar Abdul Aziz Al Marzooqi and Coral Beach Z in a time of 33.56sec and third was taken by Saudi Arabia’s Olympic rider, Abdullah Sharbatly on Quinlan in 33.77sec. Al Owais will next be seen in the CSI4* Al Shira’aa International Horse Show which gets underway on Wednesday at the same venue, where he will once again rub shoulders with high-profile international riders such as world number eight Henrik Von Eckermann from Sweden and multiple Olympian Luciana Diniz from Portugal. “I am looking forward to competing at the CSI*4 in the coming days and if God is willing, I’m looking forward to win, it would be tough as it’s a very high-level competition,” he said. The CSI4* event runs from Wednesday to Saturday and features the region’s first Derby class, which sees horses faced with different types of fences to a regular showjumping class. Tuesday morning saw all horses of the Al Shira’aa International Horse Show undertake the mandatory vet check. Visitors to the Al Shira’aa International Horse Show have the chance to win a trip for two to the Al Shira’aa Hickstead Derby in England this June by playing the Spectator Judging app prediction game. The show features free family entertainment and entrance is free. The first class on Wednesday begins at 11.30am with the 1* Cavalor Young Horse Welcome Stakes (125-130cm). The 4* Al Shira’aa UK Prize (130cm) starts at 1.30pm, the 4* YAS TV Speed Stakes (140cm) gets underway at 4pm and the Meadow Court Stud Qualifier (145cm), which will qualify riders for the show-concluding Longines Grand Prix on Saturday evening.